Our presenters have a strong background in education, field biology, and research, as well as the dedication to reaching out to the general public to improve the understanding, appreciation, and protection of wild hawks, owls, eagles, and falcons. Joe received his degree in biology from Central Michigan University, and spent many years of work in the field studying raptors. Nest studies of bald eagles, red-tailed hawks, great horned owls, American Kestrels, barred owls, and Eastern Screech Owls were a part of his early studies. Through Michigan’s Nongame Wildlife Fund, and in conjunction with the Ottawa National Forest, Pictured Rocks National Lakeshore, and The Nature Conservancy, Joe spent almost thirty years working on reintroduction and monitoring of peregrine falcons at Michigan’s Wild Sites. Joe has received numerous awards for his educational presentations in which the focus is live birds of prey, and the goal is to capture the interest of the audience so that they might become involved in becoming stewards of our environment and protectors of the natural world. 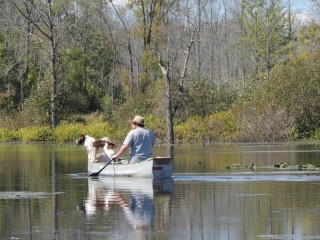 During slow times, Joe enjoys the swamp, canoeing, kayaking, hiking, and his awesome pups. Joey scouts as Joe paddles. Some of the wood duck boxes that need work are hauled out by canoe for renovation. Joanne is both geologist and research librarian, a graduate of Central Michigan University. She has worked with MLPA, Michigan Loon Preservation Association for many years as state coordinator: collecting data from lakes where loons nest, and fielding questions from all over the world concerning loons. Her work with Wildlife Recovery Association includes tracking membership, scheduling programs, and assisting with presentations with live birds of prey. Joanne enjoys working with children, and has interests in art and journalism. She often joins us on treks through the swamp and on wilderness projects. 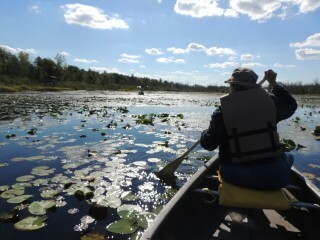 Joanne paddles through the swamp at “Little Swamp Sanctuary” to help with record keeping of nest boxes. Barb has worked as an assistant on field studies: research and monitoring of many birds of prey, alongside her husband, Joe. She worked in the early 1980s on bald eagle nest studies, and on peregrine falcon reintroduction and monitoring (at Michigan’s Wild Sites) for the past 28 years. She also cares for many orphaned and injured raptors that come in to the organization each year. She assists with the training and presentation of Wildlife Recovery Association ambassador birds for audiences throughout Michigan. She graduated from Western Michigan University with a teaching degree; her background as a science teacher of 28 years helps the group incorporate the state curriculum requirements that must now be met by many schools. Barb also enjoys her horses and doing illustrations and paintings of the birds.